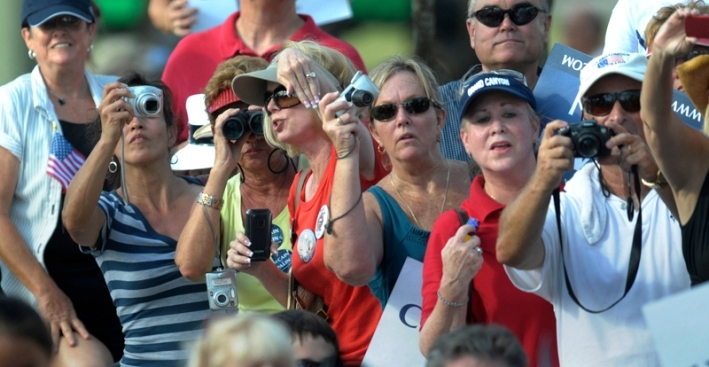 Supporters try to get a photo of Republican vice presidential candidate Sarah Palin after she spoke at a rally in Florida. Since Republican presidential nominee John McCain chose Alaska Gov. Sarah Palin as his running mate, he has erased Barack Obama’s once-commanding lead as the candidate seen by women as having a “better understanding of women and what is important” to them, a new poll of likely female voters shows. Sen. McCain now has a two point advantage – 44 to 42 percent – over his Democratic rival on that score, according to the poll conducted by pollsters Kellyanne Conway and Celinda Lake for Lifetime Television. In a July poll by Lifetime, Sen. Obama was seen as more empathetic to women’s concerns, by 52 to 18 percent over McCain. In this latest poll, conducted Sept. 11-15, age remained a key determinant in response to the question about women’s concerns. Young women, ages 18-34, chose the Obama/Biden ticket as more empathetic to their needs, while women aged 35-64 went for McCain/Palin. Unlike black and Hispanic women, white women saw McCain and Palin as most understanding of their concerns. In addition, about one in four women who supported Sen. Hillary Rodham Clinton in the primaries said McCain and Palin have a better grasp of women’s needs than Obama and his running mate, Sen. Joe Biden. The Lifetime poll reveals a diversity of women’s views on several issues, with many of those differences related to a respondent’s race, party identity, marital status and generation. However, those demographic differences faded when it came to the Democrats’ strongest showing in the poll, on a question regarding the economy. The women polled favored the Obama/Biden ticket 57 to 32 percent on which candidate “will help middle class families the most.” Polling has shown all year that the economy tops voters' concerns. The survey comes as women overall favor the Democratic ticket, 48 to 44 percent, according to the weekly summaries of Gallup polling. That marks a wider margin than Democrats enjoyed in 2004 on Election Day, but less than in 2000. That Democratic drop-off with women since 2000, Gallup polling shows, is tied to Obama’s recent downtick in white support among women and men alike. All summer Obama had roughly similar support among white women as Al Gore did in 2000. Gallup finds McCain now leads with white women 51 to 40 percent, a wider gap than the GOP enjoyed among white women eight years ago. However, it appears that Obama’s message of “change” has struck a chord with women, who in the Lifetime poll gave the Obama/Biden ticket a 14-point advantage on the question, 51 to 37 percent over the McCain/Palin ticket. Overall, women said Obama and Biden would best “reform the way Washington, D.C. does business” by 47 to 40 percent. But white women narrowly favored the McCain/Palin ticket on that count. And, independent women gave the GOP ticket an 8-point advantage on the change issue. When women were asked which ticket could better “win” the war in Iraq, white, Hispanic and independent women, as well as women of every age group, voiced more confidence in McCain/Palin. But when these women were asked which candidates can most likely “end” the war in Iraq, Obama/Biden earned significantly more support. Women under age 55, Hispanic women, and independent women had more trust in the Democrats. Yet white women voiced more confidence in McCain/Palin to end the war. Women overall did say the Republican ticket was more ready to lead, though Latinas and black women sided with Democrats. Democrats have a narrow advantage overall, 47 to 40 percent, as more capable reformers of government, though female independents and whites sided with the GOP. The Lifetime Television/Every Woman Counts campaign poll of 534 American women likely to vote was conducted September 11 to 15, and has a margin of error of 4.4 percent.